The Absolute Sandman, Volume 1 – This is probably the biggest, heaviest graphic novel I’ve ever read. 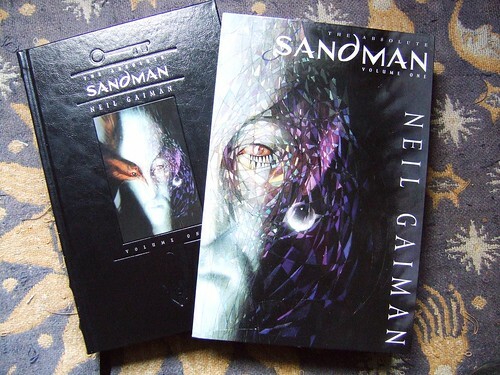 Before I started to read The Absolute Sandman Volume 1, which collects the first 20 issues of the series in a gigantic hardcover tome (and there are four more massive volumes like it), I knew nothing about Neil Gaiman’s series, except that it was critically acclaimed, and that it was full of comic characters modelled after rock stars (Robert Smith, David Bowie, Sting, etc). Wow, I’m glad I am finally hip to what Sandman is all about. It is very gothic, and is about elder gods, so it is very Kirbian, without the manic goofiness, replacing it with dark pretentiousness and careful storytelling, as well as wildly painted, arty pages. The story begins with the tale of how the Sandman was captured for 70 years by a mad magus – a cohort of Aleister Crowley – who wanted to trap Death, but only got Dream. But the ageless are the only ones who need not fear the passing of time, and with days and years and decades Dream regains his freedom, and the following adventures are about his recovery from a trapped state, which means rebuilding his kingdom, re-establishing his authority, recovering his tools, and restoring a proper dream state for humanity. Dream is joined in some adventures by Death, and briefly also by Desire, but mostly he is on his own, interacting with humans, villains, archetypes, demons and nightmares. After he recovers from his absence, Gaiman struggles perhaps to find stories to involve Dream in, but he does a few clever things. It’s a stupendous story. At the end there is the original treatment Gaiman sent to his editors at DC, as well as some essays, and Gaiman’s notes for the script for Issue 19, which recounts one of the Sandman’s many interactions with William Shakespeare, in this case the enactment of A Midsummer Night’s Dream for an audience of faeries, which is one of the great classic comic books, often cited for its clever incorporation of real-world literature. A full set of directions that Gaiman had sent to his artist is illuminating as it gives us a look into the creative process. Magnificent. The layout of the pages is inventive, playing with jagged edges between panels, full-page stuff, photos incorporated into the artwork, and so many other things. One-off stories are inventive and wonderful. Sometimes familiar characters seep into the stories, like Kane and Abel, as well as the three weird sisters (one hag, one matriarch, one babe – the Hecataea) that we’ve seen from old DC horror tales, and Gaiman is playful with these at times. The story of the sleepy sickness, brought on when Dream was captured, is interesting, and it works its way through many of the later stories in the book. Dream meets John Constantine (Hellblazer), who helps him recover his bag of sand. Recovering his helmet is more difficult – he needs to travel to Hell, where he needs to bargain with Lucifer (who looks like David Bowie) and the lords of the underworld. It’s a very clever story, and full of yucky, creepy landscapes and horribly souls in torment. Dream meets Etrigan, runs into an old friend of 10,000 years ago, Kai’ckul, who Dream had imprisoned there, and whom he still hasn’t forgiven; then there’s Lucifer, the lord of the flies Beelzebub (and he is a fly), along with Azazel, and Choronzon, one of Beelzebub’s gang. Recovering his third symbol is more difficult – he needs to chase Doctor Destiny, who has altered his ruby, sending him off to a final encounter in dream world. Here we see the first instance of Sandman being indifferent to a killer’s crimes. The death diner with Doctor Dee (or Doctor Destiny) story is a classic, as it truly probes the histories of six people, one by one, and the incident ties in to something that we learn about connections with characters we haven’t met yet. There are freaky interludes, passages to Granny Goodness’ orphanage in Jack Kirby’s tales of the New Gods, an encounter with the Martian Manhunter, a glimps at Lord L’Zoril, and then a long interlude as we get to learn about the characters in the death diner one by one, and the strange truths (or un-truths?) tha come out of them as a night of madness progresses. Doctor Dee is truly insane, and eventually confronts Dream on Dream’s own turf. Not a good idea for this sad little man. “The Sound Of Her Wings” is a tale of Dream’s sister, Death, a cute goth who wears an ankh on a chain around her neck, visiting people in their final minutes. One guy tries to hit on her, she says “see you later”… and she does. The tale has no action or confrontation, just Death trying to cheer up Dream, who doesn’t know where his life is heading now that he’s recovered his liberty and his three prized possessions. “Tales in the Sand” is one of those where Dream takes another shape – a Masai warrior takes his son into the desert and tells him a tale that is only told once in a man’s life, it is about Nada, the queen of her city, who fell in love with Dream.. or maybe it’s Kai’ckul and not Dream. “The Doll’s House” is the start of a long story arc – it introduces us to Desire, who has her plans, and re-introduces us to the family of Unity Kincaid, who was raped while she was in the long sleep and gave birth to a child, who was put up for adoption, who had two children of their own. Their story is long and strange, and after Unity wakes up, she meets her daughter and grand-daughter; the grand-son is with the estranged husband’s family (trouble there). We follow Rose Kincaid, we see her vertical dreams, we see Kane and Abel, we find out that Dream’s lost four of his minions, and these cause trouble by manipulating dreams, or at least that was something that they could do while Dream was away. Dream eventually rounds all of them up, and they all have something to do with the Kincaids. Rose moves into a strange house with strange neighbours Ken and Barbie, and the spider sisters Zelda and Chantal, who only wear wedding gowns, their faces shielded by a bridal veil. There’s the tale of the other Sandman, the fake superhero that Dream’s escaped minions create in order to torture a little boy. THen there’s the Corinthian, who becomes a serial killer, and inspires the dreams of other serial killers (who call themselves “collectors”, perhaps after the film), especially when they come together in Texas for a “cereal convention”, ha ha. “Men of Good Fortune” is an interlue, and here we meet Geoffrey Chaucer, William Shakespeare and Christopher Marlowe (with a broken leg), and where Dream befriends a man who refuses to die. They catch up every 100 years and become… friends. It’s a great, beautiful, clever journey that is full of history and great moods (and a meeting with Johanna Constantine, perhaps an ancestor of John Constantine? Have to look that up…). Rose becomes the vortex, and the book explores the dreams of the eccentrics who live in their house, and Dream realises that he may need to kill her to save the universe. Ulp! No reason given, but Rose is saved in the end in a way that… sorta makes sense. A strange story about a depraved novelist, who has writers block after penning a best-selling debut The Cabaret of Dr Caligari (ha ha) who buys the kidnapped Calliope from an aging author, very strange. Dream is her ex-boyfriend, they fathered Orpheus together, but she betrayed him. He helps her, a bit. “A Dream of a Thousand Cats” is another strange story about the cats dreaming of the old world, where they had been kings. The second-last story is the re-telling (or imagining) of William Shakespeare’s A Midsummer Night’s Dream for real Oberon and Titania and their faerie hordes. It’s highly literary, somewhat nonsensical, and exquisitely drawn and very beautiful. The faeries are very beautiful. The final tale is about the death of Element Girl, tormented by her powers and unable to kill herself. This entry was posted on Thursday, December 29th, 2011 at 6:16 pm	and is filed under Uncategorized. You can follow any responses to this entry through the RSS 2.0 feed. Both comments and pings are currently closed.